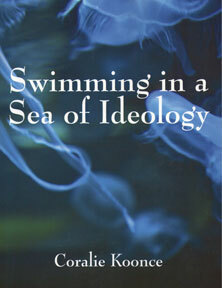 "Swimming in a Sea of Ideology" is a book which surveys a wide range of ideologies, written from a particular ideological perspective. The author, Coralie Koonce, is a "New Deal liberal" according to a typology offered in her book. It would be more descriptive to call her a statist progressive, using "statist" to mean authoritarian in the political sense, and "progressive" to mean favoring the use of government to solve social problems and promote social values. In one area, however, she is libertarian - she opposes military interventionism and imperialism. If you are a progressive, you will probably like this book a lot and generally agree with it. Koonce is very erudite - in a one-sided way. "Swimming" is an excellent resource for synopses of popular "liberal" books and standard arguments. On the downside, many of the arguments are too standard. Many are bromides or attacks on strawmen, easily refutable by knowledgeable opponents. If you are not a statist progressive, the book might be considered an encyclopedia of "liberal" mythology. The book starts promisingly, with three definitions of "ideology." Definition (A) is "a systematic body of concepts." (B) is a "collective frame, containing the main social assumptions of society," including "conventional wisdom created by sheer repetition." Definition (C) takes ideologies to be "collections of ideas ... that individuals hold voluntarily and consciously." "Ideology" is a positive word to some people and a negative word to others. Those who think of ideology in a positive light use the word in sense A and C. They consider having an ideology to be a good thing, and conversely, not having an ideology to be characterized by opinions and beliefs which are confused, inconsistent, or random. For others, "ideology" is a negative word. They tend to see people with ideologies as rigid and uncritical thinkers and/or mired in tradition. Clearly Ms. Koonce takes the latter approach. After page one, "ideology" almost always refers to types B or C.
One might suspect that there is a risk of taking (A) to mean ideologies one agrees with, (B) to mean ideologies that are so absurd they are not worth even considering, and (C) to mean an ideology that you disagree with, but is at least plausible. And one would suspect correctly; the author frequently does this. But Koonce is wise enough to realize this, writing, "Rule of Thumb: It is often easier to identify the other person's set of ideas as an ideology than your own." The best parts of the book are Koonce's historical briefings. The histories of feminism and Borderers (Scot-Irish in America) are excellent. Also, the chapters about science and technology, mass media, and the UN are good. She offers solid advice about how to recognize conspiracy theories. However, in political and economic subjects her ideology often leads to dubiousness. Surprisingly, she borrows her political ideology spectrum from the radical libertarian, arguably anarcho-capitalist Karl Hess. This model sees the spectrum as a circle, with extreme left and extreme right coinciding. This is strange because of Koonce's great antipathy for libertarianism, especially anarcho-capitalism, later in the book. I found it surprising that she didn't consider more modern two-dimensional models which seem much more explanatory than the circular model. Ms. Koonce joins other vulgar anti-capitalists like Naomi Klein ("The Shock Doctrine") in conflating all five of these definitions. For example, Koonce considers wage labor to be "the first defining characteristic of capitalism." Yet many libertarians and virtually all anarcho-capitalists believe that wage labor is not a necessary part of a private ownership free market (definition 1), and that wage labor would be rather insignificant in a truly capitalist system. Similarly, many/most of these people consider corporations a result of State intervention; they also would largely die out in a capitalist system. The author gets an "A" for liberalism and an "F" for capitalism. Her descriptions of socialism, communism, and the mixed economy are fine. Later, when discussing environmentalism, she's back in form, listing 28 forms, although as might be expected, leaving out the important branch called free-market environmentalism. It's apparently off her radar due to her statist progressive ideology, even though the recent popularity of conservation easements have put this view in the limelight. Koonce misses a golden opportunity to discuss semantic arguments when she takes on the question of "America: Democracy or Republic." American "liberals" tend to strenuously assert that the US is a democracy, while "conservatives" ardently insist that it is a republic. In political speeches, this is an almost fool-proof code word identifier. The right answer for a critical thinker is to say it depends on how you define "democracy." If you define democracy as majority rule, i.e. direct democracy, then the US is not a democracy. But if you define democracy broadly to mean "people rule," then the US is a democracy at least formally. If you go on to define "republic" as a representative democracy, then the US is a republic. Yet Ms. Koonce seems to come down on the "liberal" side of the verbal dispute. Sometimes her ideology prevents her from grasping a concept, and she misses the boat entirely. For example, in the "Big and Little Government" section she takes things literally and thinks the issue is about size. This is very puzzling to me, that someone of her intelligence and erudition would be oblivious to the obvious: that authority - the intensity of government power - is the issue. After all, luminaries ranging from George Washington ("Government is not reason; it is not eloquent; it is force. Like fire, it is a dangerous servant and a fearful master.") and Jefferson ("I own I am not a friend to a very energetic government. It is always oppressive. It places the governors indeed more at their ease, at the expense of the people. "), to Lord Acton ("Power corrupts; absolute power corrupts absolutely. ), to Mao Tse-Tung ("Power comes from the barrel of a gun.") understood this concept. But Koonce's ideological frame apparently won't allow her to see that effectiveness of government is not the only concern. There is a trade-off between effectiveness and power. Many, such as those who value liberty, prefer less government power to wield violence, even if that makes government less effective by someone's standards. The danger to liberty may not be worth the extra efficiency. While good at spotting fallacies in opposing positions, Koonce frequently uses false dichotomies and strawmen herself. One example: In a discussion on firearms, she writes, "As an alternative to everybody packing guns, maybe the nation could make more of an effort to reduce racial inequalities." Wow - a strawman and a false dichotomy in one short sentence. Of course, people who favor a right to bear arms don't want "everybody" to carry. They would prefer criminals and insane people not carry, for example. Most would conjecture that if only modest percent carried, crime would be deturred. Saying that people who support the right of self-defense want everyone to carry is as absurd as saying people who support freedom of speech want everyone to become an orator. The false dicotomy: We can both reduce racism and take responsibility for self-defense - one does not preclude the other. The same section claims that "gun proponents" who worry about tyrannical government are unaware that "handguns are not the typical weapon of choice for guerrilla warfare." Yet they seem much more aware than Koonce, a well-known dictum being "Remember, a handgun is only how you fight your way back to your rifle." (Boston T. Party.) Of course, this is another strawman - people keep handguns for self-defense against crime, not to engage in guerrilla warfare. Koonce seems unaware that statistics, most recently in Britain and Australia but also in comparative studies of US states, show more gun ownership means less crime. She also ignores the role victim disarmament plays in genocide and democide, a consideration that dwarfs private crime considerations. While some parts of the book are well-researched, other parts are not. The section about anarcho-capitalism I found disappointing personally, since Koonce did not even bother to read my well-known Anarcho-capitalist FAQ. When discussing Benjamin Tucker, Koonce mentions that he opposed usury but neglects to mention that he supported private ownership of the means of production and free markets, thus characterizing him in a highly misleading way. More importantly, Koonce claims that the anarcho-capitalist movement "has no program for how the economic system would get from here to there." Yet my FAQ specifically cites, in addition to education, four strategies: Gulching, PT, agorism, and creating parallel structures, i.e. alternatives to State institutions. Then she implies that the ultra-nationalist militia movement has something to do with anarcho-capitalism, and resorts to outright smear tactics by trying to associate ancap with "domestic terrorism, ... racist ideologies, Christian Reconstructionism[! ], and conspiracy theories." This of course is pulled out of her navel; I'm an expert on anarcho-capitalism and I've never heard of any ancaps associated with these. Of course, there may exist some such people, but this is on a par with someone saying that Ted Kaczynski, the Unabomber, is a typical environmentalist. Another example of insufficient research: Koonce writes that Social Darwinism was used "To justify colonialism, since native peoples were regarded as less fit. Spencer's notion was put forward during the peak of the British Empire..." In fact, Herbert Spencer was a, perhaps the, prominent figure opposing British imperialism. He founded the "Anti-Aggression League," and wrote a classic anti-imperialist essay called "Patriotism." In it, Spencer wrote, "To me the cry 'Our country, right or wrong!' seems detestable. By association with love of country the sentiment it expresses gains a certain justification. Do but pull off the cloak, however, and the contained sentiment is seen to be of the lowest." Spencer recalls an army captain who told him that the troops in Afghanistan were in danger. Spencer replied, "When men hire themselves out to shoot other men to order, asking nothing about the justice of their cause, I don't care if they are shot themselves." Apparently he, like me, considers people who join the military of an imperialist power to be hired murderers. Another famous alleged supporter of Social Darwinism, William Graham Sumner, was vice president of the Anti-Imperialist League, formed to oppose the Spanish-American War. The whole notion of Social Darwinism is largely a strawman. Spencer wrote that a society in which people practice voluntary charity ("positive beneficence") was more highly evolved ("fit") than one that did not. He was an early supporter of woman's rights and even children's rights. No historical figure ever called himself a Social Darwinist. The term was popularized long after Spencer and Sumner were dead, by Richard Hofstadter, as a political polemic. Koonce seems to rely too much on second-hand information; sometimes her failure to read opposing viewpoints is obvious. For example, she discusses Bjorn Lomborg's book "Cool It" apparently without even having read it. She correctly relates that Lomborg says "our fears are out of proportion." But then she claims that "his argument is narrowly based on the fact that UK and some other parts of Europe have many winter deaths." In fact, Lomborg has a broad range of arguments. He shows convincingly that, if the average earth temperature were to increase a degree, there would be fewer deaths in the world due to extreme temperatures. He notes this in illustrating how many alarmists look at only one side of the coin - more deaths due to heat - and ignore the other side - many fewer deaths due to cold. Koonce says Lomborg "assumes it [global warming] means only that the temperature will gets warmer" and "ignores ... floods, doughts, wildfires, turbulent weather, and rising seas." This is more evidence that she has not read "Cool It," as he does discuss these, with particular emphasis on floods and rising seas. Lomborg believes that harm reduction and adaptation is a better, more cost effective solution than attempting to marginally change the climate a fraction of a degree or so in a century at tremendous expense. Lomborg's main arguments have to do with a cost benefit analysis of solutions to problems. The Copenhagen Consensus, a series of studies by scientists and experts, shows that the most cost effective solutions to world problems are related to preventing HIV and AIDS, providing micronutrients and potable water, and trade liberalization. Policies attempting to "solve" Global Warming had "costs that were likely to exceed the benefits," although a modest carbon tax was deemed reasonable. Koonce's whole discussion about Lomborg consists of red herrings. Watch this seventeen minute YouTube video for a good synopsis of the Copenhagen Consensus: Bjorn Lomborg: Our priorities for saving the world. One of the better chapters in "Swimming in a Sea of Ideology" discusses science, the difference between science and technology, scientism, and anti-evolution ideologies. One inconsistency I caught was, in some parts of the book (e.g. pg. 80), Koonce classes eugenics as science. By the logic of the science vs. technology section, eugenics would be a technology and an ideology. Genetics is the science; eugenics is the related politicized ideology. Just as climatology is the science, while global warming alarmism is the related politicized ideology. The science of genetics in no way implies that governments should have a policy of sterilizing retarded people or killing Jews. The science of climatology in no way implies that governments should accept the Kyoto protocol or spend money trying to change the climate. Koonce would probably disagree with that when it comes to global warming, since she seems to have fallen for the alarmist ideology, hook, line, and sinker. But her chapter on science gets it right, even if she neglects to apply her lesson to the global warming issue. The section on the environment smacks of ad hominem - genetic; ideas and scientists are often rejected simply because they were funded by corporations or promoted by "Conservative think tanks." It is one thing to be skeptical and ask who benefits, but quite another to reject research or results out of hand. Furthermore, Koonce totally ignores the other side again. We should be equally suspicious of government funded research and neo-Lysenkoism. Amazingly, she asks (through George Monbiat) why "the IPCC, in collusion with governments, is conspiring to exaggerate the science." Obviously for the same reasons that government conspires with established corporations - it gives politicians a way to sell favors for wealth, power, and reelection. It builds a constituency beholden to the State. Again, her ideology only allows her to see one side of a two way street. The feminism/anti-feminism chapter has a wonderful history of feminism, including a lot of "lost history" of which I was unaware. This is perhaps the best chapter of the book. It did leave out my favorite historical feminist, Voltairine de Cleyre, but as compensation I learned about Mercy Otis Warren, who I had not heard of before. When discussing feminist ideologies, I expected at least a mention of individualist feminism, which is concerned with equality of rights rather than equality of outcomes. The discussion of gender feminism, which posits a class war between men and women, could have been expanded upon. But all in all, this chapter was excellent. "Swimming in a Sea of Ideology" covers so many areas and issues that it is almost unfair to complain about omissions. Almost. Koonce's statist progressive ideology leads her to neglect several pertinent subjects. I would have liked to see chapters about the ideologies of progressivism, statism, and Keynesianism. Progressivism is the belief that government violence (or the threat of it) is a good (or the only) way to promote social values. Progressivism, or its precursor, developed in the 19th century as a faction of abolitionism. After the Civil War, its main issues were alcohol and drug prohibition, Blue Laws, and a compulsory government-run authoritarian ("Prussian") school system (mainly in order to assimilate "Papist" immigrant children.) In the late 19th and early 20th century, progressivism morphed into a non-religious, corporatist proto-fascist ideology, favoring government regulation of (and in reality cartelization of) certain big businesses, such as railroads and oil companies, and later the banking industry. No doubt, because Koonce herself holds a progressive ideology, she does not identify it as an ideology per her "rule of thumb." That is a shame, since this is a rich subject. One source that might supplement her book is "The Progressive Era and the Family" by Murray Rothbard. Koonce does mention Keynesianism, but only in the context of the military. She correctly sees that Keynesian economists recommend spending as a solution to almost anything, but politicians are loathe to cut spending even in good times. But her ideological blinders won't allow her to discuss how this is just as true for domestic spending as it is for military spending. I would have enjoyed a discussion of political incentives with respect to why government hires Keynesian advisors almost exclusively. The short answer: Politicians have an incentive to spend on their constituencies, and Keynesians offer to justify and approve such spending "scientifically." You don't need a doctorate in Public Choice Theory to figure out why the ruling elites hire spending-friendly Keynesians rather than tightwad Austrian economists. A chapter on Keynesianism would be timely now that Keynes is dead and we are living with the results of his long run. Worse, Obama is exacerbating the depression with more of the same Keynesianism. Koonce has a very informative chapter about Borderers (Scots-Irish) and their influence on the ideologies of militarism and religious fundamentalism. However, she totally ignores their counterpart, the Yankee pietists, and their influence on progressivism, statism, and the welfare state. This is yet another example of her ideology causing a blind spot. Finally, I would have liked a discussion of the relationship between ideology and historiography. People tend to see history through an ideological lens, cherry-picking events that support their ideology and ignoring others that don't. Interpretations of historical events are colored by ideology. One blatant example from the book is Koonce's claim that the 1920's was a laissez faire period. In her statist progressive ideology, the failure of the laissez faire 20's justified the fascist New Deal. But in fact, during the 1920's the government had more control and more intervention in the economy than ever before, except during World War I. Even progressives must admit that banking is a key command post of capitalism. The Federal Reserve Bank was founded in 1913, inaugurating the current epoch of central banking. The 1920s were the first full decade of government-controlled banking. The Fed vastly increased the money supply during that period for political reasons (the US ruling elite wanted to help Britain return to the pre-war sterling-gold exchange rate). This is all documented and well-known among economists, with many studies (perhaps most notably in "Monetary History of the United States," 1867-1960, Friedman-Schwartz). Furthermore, as academics such as Robert Higgs ("Crisis and Leviathan") have shown, the ratchet effect ramps up government power during a crisis (WWI in this case), but after the crisis the level of power does not go back down to the pre-crisis level. In short, the suggestion that the 1920s were "laissez faire" is ludicrous. Another example of ideology-induced historical myth is the belief, common on both the left and right, that late 19th century US had rampant unrestricted laissez faire capitalism. Generally, the left sees this as bad while the right sees this as good - but in fact historians from Gabriel Kolko to Murray Rothbard, and lately Kevin Carson, dispute this view. It seems that this period saw many government-business "partnerships," or more accurately massive collusion, in order to cartelize various industries for the benefit of politically connected firms. Evidence, such as the fact that powerful affected firms supported anti-trust and regulatory control belies the notion that these measures were anti-business. See Roy Childs' "Big Business and the Rise of American Statism," Rothbard's "The Federal Reserve as a Cartelization Device," and Kevin Carson's recent work "Organization Theory" for details. Ms. Koonce is better at attacking ideas than stating (let alone defending) her own ideas. Her modus operandi is to actively dispute ideologies and ideas she disagrees with, then to quote an author of a popular statist progressive ("liberal") book with no critical analysis. It is quite clear from context that she agrees with this "final word," but she doesn't come out and explicitly say so. This bothers me for some reason. She seems afraid to make any clear-cut claim or wants plausible deniability, so hides "under cover" of another author. This is done repeatedly throughout the book. Perhaps she considers this to be good scholarship, but it strikes me as somewhat cowardly. One production flaw I noticed: some of the page numbers in the index are off by a few pages. The strongest parts of "Swimming" are those not directly related to economics or politics. The chapters on science and feminism are very good. The book is quite opinionated. Sometimes the reader will nod in agreement; other times he might feel like pulling his hair out or stomping on the book in disgust. It will challenge you to think critically, whether you are at the moment agreeing or disagreeing. The author doesn't seem to have read anything opposing her authoritarian progressive viewpoint, so don't expect anything remotely resembling balance. But she is both smart and erudite in her one-sided way - " Swimming" will certainly stimulate the intelligent reader. If you seek summaries of "liberal" books, an encyclopedia of "liberal" myths, or an exercise in finding informal fallacies, I recommend this book.